Celebrate Recovery is a discipleship ministry and Bible study that helps you break free from going backwards or standing still in life and helps you move forward! We open the door to recovery when we finally admit that we can't do life on our own. Every time we try, we end up with the same crazy results instead of the good results we wish we had. 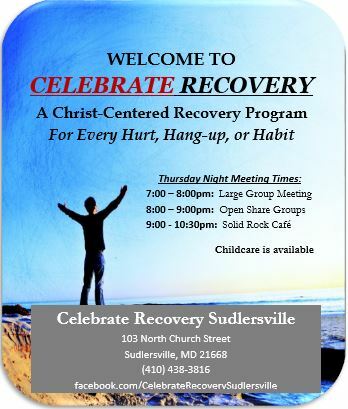 At Celebrate Recovery, you will meet men and women who have been down these dark roads but know the way out! They are here to help you, to share their experience, strength and hope -- whether you are lost and don't know where to start or you're just beginning the journey. By learning and working biblical steps, we grow spiritually and become free from any behaviors that hold us back. God loves you more than you know and wants the best for you. With this new found freedom, we receive peace, serenity and joy. Most importantly, we experience a stronger personal relationship with God and with others.